It’s like Trials HD...except completely insane. In an early level of Trials Evolution called Ridinghood, we gleefully rode through a lightning fast level, ramping off ancient ruins with a blood red sky in the background, featuring a moon that's easily ten times too large. When we ramped across the finish line, our rider floated off the motorcycle and flew quickly up into the sky, higher and higher, faster and faster until he crashed into the moon in an explosion visible from Earth. 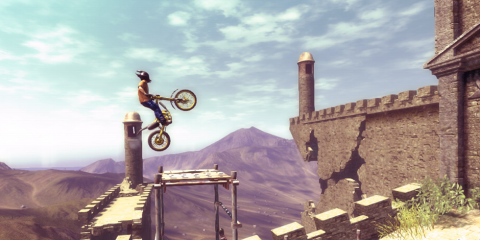 In short, Trials Evolution is completely insane. Trials HD, its predecessor, also featured some over-the-top moments, but it was the sort of on-the-leash insanity that comes with a more modest debut. Now that Trials HD proved there’s a strong audience for this type of game, the leash has come off and developer RedLynx's sequel wonderfully expands the premise. The core gameplay remains unchanged from the previous iteration. You ride a motorcycle through increasingly difficult courses, and it’s heavily physics-driven. But that simple explanation belies considerable brilliance on the part of RedLynx. Trials Evolution’s boldest achievement is that it manages to be a racing game, a platformer, and a puzzle game depending on which track we’re playing. In the beginning, the game taught us the basics of riding by introducing fast courses in which speed takes priority. This allowed us to master the basics without much difficulty, but with plenty of excitement. Before long, the courses shift and become more about leaping difficult gaps and keeping the right amount of momentum at the right times, much like a platformer. By the end of the game, we were studiously examining a sheer cliff face, trying to figure out how in the hell they expected us to get up there on a motorcycle. The track creator is also returns, which allows players to upload their designs to RedLynx's servers, and download other player’s tracks. As is often the case, we needed to wade through a lot of chaff to find the few excellent tracks. It doesn’t help, unfortunately, that it will take heaps of patience and experience to endure Evolution’s lackluster track creation controls. Trials courses are very intricate, like the core gameplay. It took us an hour to create a basic track with a start point, finish line, and a few simple ramps in between. If you enjoy investing time in user-generated content, there’s no shortage of options, but don’t expect the accessibility found in other titles. It doesn't sound like much, but the change of scenery is the greatest distinguisher for Evolution. The shift from Trials HD's claustrophobic warehouse makes difficult courses much easier to bear, and eases the frustration factor. Furthermore, it allows RedLynx to create tracks that are just plain fun. Most tracks in the previous game were created to be difficult, but in Trials Evolution some tracks seem to exist purely because they're amazing to ride. They feel more like roller coasters than challenges. But a change in tone isn't all that's new to the series. Evolution also implements multiplayer in the form of (up to) four-player competitive races either online or locally. It's not exactly bursting with exciting new content, but it's a welcome addition. While it's no game changer, it adds another dimension to the action, giving players new methods of competition beyond beating friends’ times. We liked Trials HD, and after playing Trials Evolution, we can heartily recommend it to fans of the original. And for those who’ve never tried Trials before, this is an excellent starting point. Evolution is a wonderful game that’s rich with personality (including a surprising sense of humor) and sophisticated gameplay. Despite its deceptively simple premise, this is a game in which we plan to invest countless hours. Trials Evolution deserves a spot on every Xbox 360 owner's hard drive. Description We liked Trials HD, and after playing Trials Evolution, we can heartily recommend it to fans of the original. And for those whove never tried Trials before, this is an excellent starting point. Evolution is a wonderful game thats rich with personality (including a surprising sense of humor) and sophisticated gameplay.